Current DVWS parents in the Grades and Early Childhood are invited to a parent night. Chris Kelly will lead us in an exploration of the way the Waldorf curriculum expands and spirals from EC though 8th grade. What students experience through observation and direct immersion as youngsters deepens and broadens with each year of the curriculum. The full journey through the grades offers students a remarkable and connected education that will serve them for the rest of their lives. 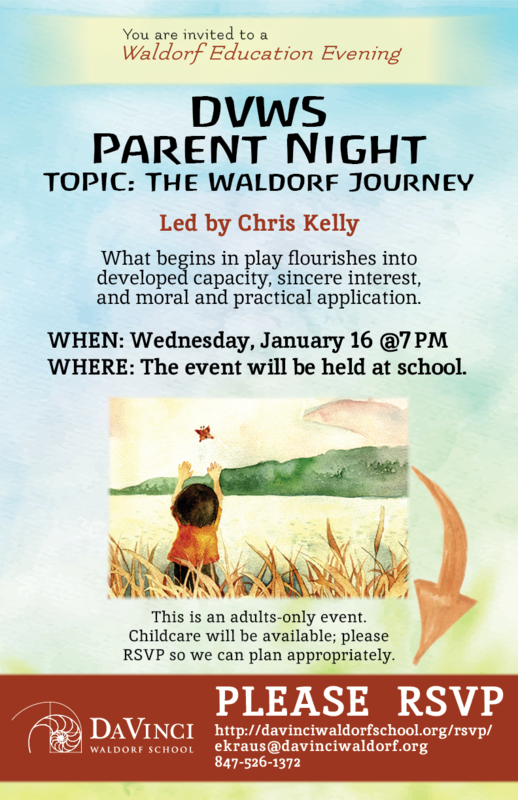 The Waldorf Journey: What begins in play flourishes into developed capacity, sincere interest, and moral and practical application. Childcare will be provided. Please RSVP so we can best plan.